The heir is the boy, even if the girl was born first. Males have precedence over women in the succession line in Monaco. Was the girl first-they grab the ones that's closest when they make the incision, even though it doesn't matter in this case for succession!! So if Dec 25th was her due date, she was exactly 38 weeks today. That's great for twins, good job Charlene!!!! I really like the names, good choices. Well done ChaCha - Congrats all around. Lovely that they have a little couple, I think that makes things a lot easier. two boys with one iheriting the throne and the other losing out for a mere couple of minutes would be more difficult. I would like to imagine that it will become easier for female souvereigns in the next generation, but right now, I think it is easier for a female consort than for a male one. The traditional roles are simply too gender specific. Gabriella is titled Comtesse de Carladès, located in Auvergne. She is second in the succession line after Jacques and before Caroline. Good choice of names! I especially like Gabriella. Hope mother and babies are healthy. Congratulations to Charlene and Albert. 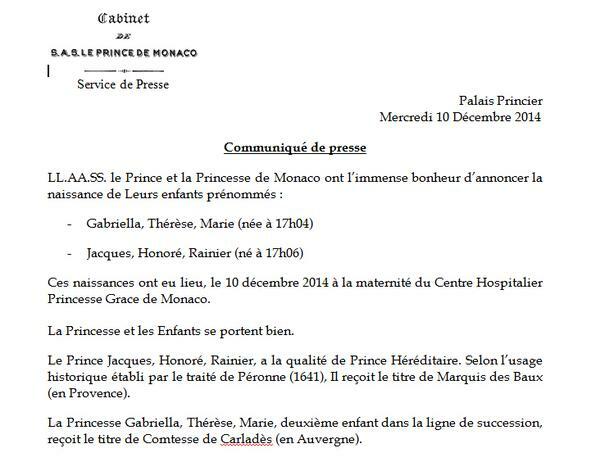 I love the little girl's name and I like Honore and Rainier but while Jacques isn't awful it doesn't seem like a name worthy of a reigning prince one day. Prince Jack is basically his name. Doesn't roll off the tongue. At any rate what matters is that they are healthy and that Charlene is doing ok. She'll need a few days in the hospital to cover from the stitches or I guess they do staples now either way. I hope she loves motherhood.